We have limited information about this panel as it was one of the very early ones and had no recorded details. This Quilt was worked on by Rod Hutchinson (Ray’s support person), Debs, Noeline Creighton, Alistair Hall and Glen Morris, who visited Ray in hospital. 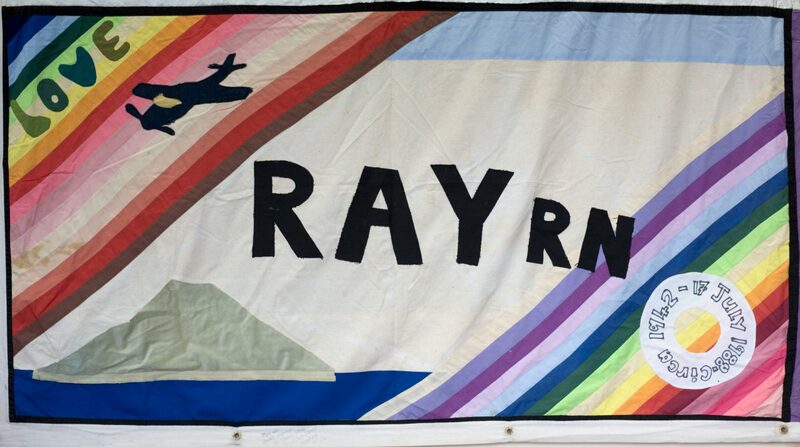 The ideas were co-ordinated by Noeline to include rainbow colours and the fact that Ray had been a registered nurse. The panel was to incorporate the words ‘thump-bang-crash’. Lying in his bed Ray was constantly disturbed by people up and down stairs, in and out of doors. These were his favourite words to his visitors, however, they never were added to the panel.